Very soon, Nokia will have smartphones in all price categories. After launching their flagship, the Nokia 8, HMD is all set to target the opposite end of the market with an expected launch of a budget smartphone, the Nokia 2. In addition to Nokia 8, Nokia 3, Nokia 5 and Nokia 6 are currently available in the Indian market. We had earlier reported that HMD might launch the Nokia 7 on 31st October. Now the rumours are saying that it might be the Nokia 2. 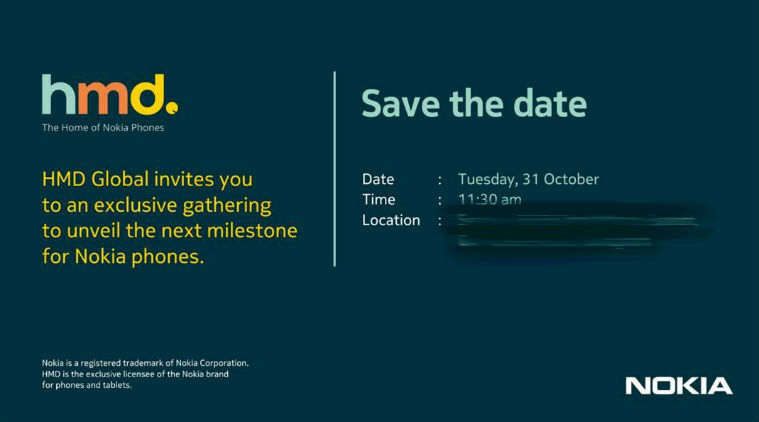 Even the official invite from HMD Global plays all mysterious and doesn’t give any hints of the upcoming smartphone. It could be either one from Nokia 2 or Nokia 7. Nokia 2’s Antutu benchmarks have been revealed through a screenshot of the results, courtesy of a tech website. 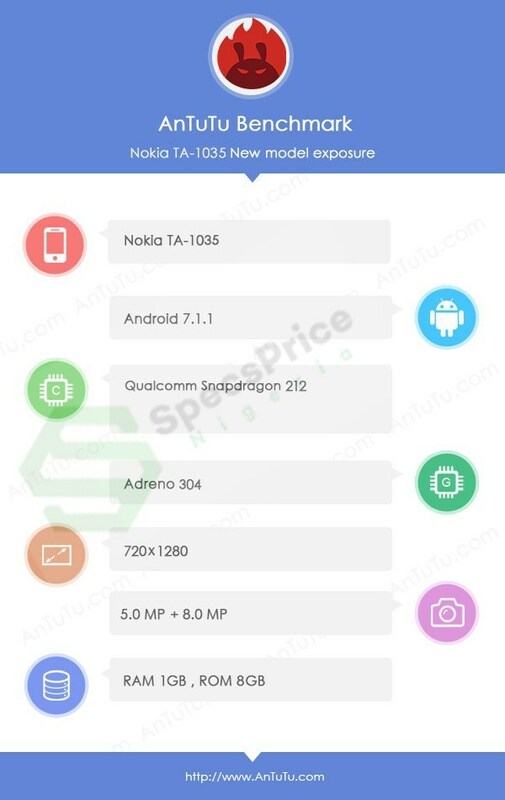 The screenshot shows the benchmark results of a Nokia model TA-1035 and shows almost all the hardware specifications of the smartphone. Interestingly, though we know the display resolution, we do not know the actual screen size of the smartphone. But it is expected to be between 4.7 and 5 inches, which will be at par for its price range. The highlight of this smartphone is going to be its 4,000 mAh battery! At this price point, a 4,000 mAh battery is a rarity and will definitely be a deciding factor in favour of this smartphone. The Nokia 2 is expected to cost between Rs. 6,000/- & Rs. 6,500/-. With its price & list of specifications, the Nokia 2 will compete with the likes of Redmi 4A, Samsung Galaxy J3, Karbonn K9 Grand and Motorola Moto C. Though there are many smartphones available in this specifications and price range, these some of the better-selling smartphones, in this price-range, in the market today. The Redmi 4A packs in 2GB RAM and 16GB storage in the lower-spec’d variant. At Rs. 5,999/-, it also beats the Nokia 2 in pricing. But the biggest drawback of the Redmi 4A is it availability. It is still being sold in the form of flash sales, which makes its availability speculative at the best. The Galaxy J3 features the same display resolution as the Nokia 2. It packs in the same 8GB storage, but beats the Nokia 2 with 1.5GB RAM. It also features expandable storage up to 256GB, whereas it is yet unknown whether the Nokia 2 supports expandable storage. On the other hand, the Nokia 2 features a Snapdragon processor over the J3’s Spreadtrum processor. The Karbonn K9 Grand features similar specifications to the Nokia 2 with 1GB RAM, 8GB Storage, 8.0-megapixel main camera and a 5.0-megapixel selfie camera. But, the K9 Grand pulls ahead with a fingerprint scanner and a lower price. This is going to be a tough one to beat. The Motorola Moto C packs in 1GB RAM and double the storage at 16GB. But it loses out in the camera department with 5.0 megapixels and 2.0 megapixels, primary and selfie cameras respectively. It also falls behind on screen resolution with a 480 x 854 pixels screen resolution. Its only advantage against the Nokia 2 is the lower price. It remains to be seen, which smartphone/s HMD launches at their launch event tomorrow. Nokia’s smartphones are slowly but surely gaining acceptance with their attractive pricing and some serious advertising. As far as the Nokia 2 is concerned, let’s wait & watch. It is going to be an exciting November! "Nokia 2 Launching In India; Benchmarks & Hardware Revealed", 5 out of 5 based on 1 ratings. Nokia 2 Launched – Premium Build, Big Battery & Brand Power!